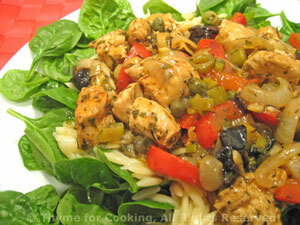 Mediterranean Chicken Salad on Spinach, Thyme for Cooking summer salad. Slice pepper into strips, then cut strips in half. Heat oil in a large skillet over medium-high heat. Add cumin, herbs and sauté briefly. Add onion, peppers, garlic, chicken and sauté until vegetables are tender and chicken is browned on all sides. Add sherry, vinegar, stock and bring to a simmer. Dissolve cornstarch in water and add, stirring until thickened. Remove from heat and add olives and capers. Prepare spinach or greens, spin dry. Arrange on two plates. Divide orzo and spoon on top of greens. Divide chicken and spoon on top of orzo. Serve.